Efficiency is unquestionably the largest, cheapest, and cleanest wedge among the many we need de-carbonize our energy economy. 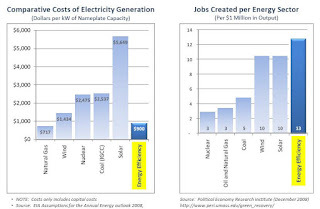 Energy efficiency tends to cost just 1 to 3 cents per kWh saved, far less than even coal-fired generation. Every renewable technology, from wind to solar, to biomass, has trade-offs. Given these advantages over generation and given an even moderately efficient market, you would expect that all the cheap energy efficiency measures would long ago have been taken until the marginal price of the next efficiency measure was above the marginal price of added electricity generation. So why hasn’t it? The usual answers, lack of financing, perverse incentives, and disinterest on the part of people for whom energy is only a tiny part of the budget don't explain the whole picture. A key reason we haven't created effective markets for energy efficiency is that it’s also hard to measure in a way that everyone will agree. To compute the energy savings from any activity, you have to establish a baseline: how much energy would you have used if you had not changed your methods. Even in the simplest case of replacing an incandescent bulb with a CFL, we don’t really know that the bulb we replace would really have stayed in the socket until the CFL breaks: A CFL can easily last 10 years, and by that time, we may be replacing all our bulbs with LEDs (light emitting diodes). And that does not even begin to account for the effects on our HVAC systems. The commission spent $97 million developing an exhaustive system for evaluating and verifying the utilities' energy savings, a process that wrapped up in 2010. But the utilities wanted their performance to be evaluated by the standards that the commission used when the rewards program began. The program sets efficiency goals in three-year cycles, and the utilities complained that changing measurement standards after the start of a cycle would be unfair. By the old measurement standards, the utilities met their efficiency goals in the most recent three-year cycle, which ran from 2006 through 2008. By the new standards, they didn't. As a result, one of the commission's administrative law judges had proposed that the utilities receive no additional awards. Commissioners Dian Grueneich and Nancy Ryan sided with the judge, arguing that the utilities knew their measurement standards were out of date and should have changed their efficiency programs. "Efficiency programs and their administrators must be able to adapt to evolving market conditions in real time," Grueneich said. "Otherwise, actual savings may fall woefully short." The three other commissioners, however, sided with the utilities, even as they acknowledged that the rewards program needs reform. A key factor contributing to the differences between ex ante and ex post savings is the much lower than expected impact of interior screw lighting measures (CFL's), as they made up a significant portions of the portfolio, adjustments to NTG ratios, installation rates, and unit energy savings based on the Energy Division evaluation all contributed to these impacts. 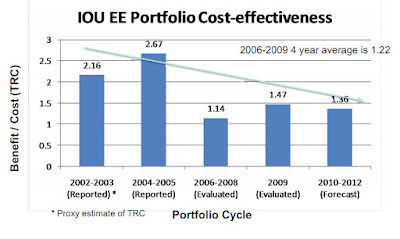 Rather than assessing the performance of the utilities’ energy efficiency programs based on updated parameters, as was the CPUC's original intent, the CPUC modified the mechanism such that the performance against the goals as well as the total savings attributed to the utility programs for purposes of determining incentives are calculated using the parameters that were in place at the time the Commission approved the utility energy efficiency portfolios. Because this increased the risk to ratepayers of providing incentives for savings that based on updated assumptions may not be attributable to the utility programs (and conversely, reduces the risk to the utilities of incurring penalties) they also make a commensurate change in the shared savings rate applied to the performance earning basis, reducing it from the 9% and 12% levels adopted in D.07-09-043, to 7%. In September 2009, the CPUC approved funding and programs for the 2010-2012 energy efficiency program cycle. The Commission authorized $3.1 billion in funding for energy efficiency programs that are projected to save 7000GWh, 3460MW, and 150 MMTherms. The funding is 42% higher than the prior three-year cycle and will support programs designed to produce deeper and more comprehensive savings that the Commission believes California's utilities can and will achieve. The commission is still trying to decide how to measure energy savings for the current three-year cycle. EM&V - Evaluation, Measurement and Verification - The crux of the success of energy efficiency as California's resource of first choice. EM&V is important for several reasons. It is necessary to determine whether and how well current individual programs are working. EM&V is critical in considering how to improve programs and for development of new measures. EM&V is used on a broad level to measure whether the investor-owned utilities (IOUs) are meeting, on a portfolio basis, the overall energy savings goals established by the Commission. Robust EM&V is critical to ensure that the IOUs and the state can depend on energy efficiency as a resource. DEER - Database for Energy Efficiency Resource - A CEC and CPUC sponsored database designed to provide well-documented estimates of energy and peak demand savings values, measure costs, and EUL all with one data source. The users of the data are intended to be program planners, regulatory reviewers and planners, utility and regulatory forecasters, and consultants supporting utility and regulatory research and evaluation efforts. DEER has been has been designated by the CPUC as its source for deemed and impact costs for program planning.The database contains NTG, EUL and UES values for standard or “deemed” energy efficiency measures. Deemed measures are energy efficiency projects and technologies that are relatively simple to analyze and evaluate, and do not vary tremendously with individual projects. Measures whose performance varies significantly due to the specifics of the individual projects are categorized as “custom” measures and are not currently covered by DEER UES values. However, DEER NTG and EUL values are used for custom measures. EUL - Effective Useful Life - The general approach for selecting EULs for the 2008 DEER Update was to review the various data sources and their underlying strengths and weaknesses and provide EUL recommendations that were determined to be most appropriate, based on the information that was available. Factors that contributed to selection of an EUL for a given measure included: the technical strength of the study supporting an EUL, the appropriateness of the study for the measure and market under consideration, the number of studies recommending the same EUL (or similar EULs), and the reasonableness of the source EUL in light of EULs for similar measures. In some cases, EULs were extracted directly from source data, and in other cases, EULs from different sources were averaged. This second approach was used when there were a range of EUL estimates from different sources, and a preferred source could not be identified. For a number of measures, there was very limited information on EULs. For these measures, it was necessary utilize EULs from similar types of measures and to utilize judgment-based EUL estimates. For example, the EUL for residential indoor CFLs failed to reflect usage patterns associated with those CFLs and led to shorter lamp life than the rated life. After considering available studies and other evidence, the Energy Division adjusted the EUL for indoor residential CFLs to reflect usage patterns associated with indoor residential CFLs. NTFR - Net of Free Rider Ratio - In the context of energy efficiency, "free riders" are those program participants who would have undertaken the energy efficiency activity in the absence of the program. Program savings are adjusted to remove the effect of free riders because their participation would have happened anyway, and therefore the savings associated with their actions cannot be considered a benefit of the program. NTG - Net-to-Gross Ratio - Total number of participants that are not free riders - Has two conceptual components Free-ridership is a subtraction (the savings of those who would have done it anyway or the partial savings for those who would have done it later are subtracted from the gross savings). Spillover is an adder (savings are added for things that are done outside the program). The principal complaint about net-to-gross is measurement related. That is, free-ridership and spillover are difficult to measure. The contention is that because there are so many things going on within our society and culture, it is difficult to measure and disentangle the effects of past programs and other influences (climate change, green building, climate change, etc.). The flip side of the argument is that it is important to establish NTG because without it, it is difficult to determine where to put the limited dollars that are available for efficiency. In California, there are real concerns expressed by the utilities about the forecasting uncertainties they face with respect to "truing up" NTG ratios. For example, The NTG for CLFs is one of the key parameters that has changed, as consumer demand for CFLs has increased due to the combined impacts of utility rebate programs, supply growth and price declines from large retailers such as WalMart, and greater public awareness of the impact of climate change and its relation to electricity production. RUL - Remaining Useful Life - relevant for early replacement measures that are designed to retire equipment before the end of their useful live. Early replacement measures capture additional energy savings that result from the replacement of older, less efficient equipment with newer, higher efficiency equipment. Normally, energy savings for “replace on burnout” measures are calculated as the difference in energy use between the high-efficiency equipment and standard-efficiency equipment that would have been purchased without program intervention. For early replacement measures, energy savings are calculated in two parts: for the RUL of the old equipment, savings are calculated as the difference between the energy use of high efficiency equipment and the old equipment that is being replaced, and for the remaining measure live, savings are calculated as the difference in energy use for the high-efficiency equipment and the standard-efficiency equipment. For RULs we have proposed using 1/3 of the estimated EUL for a measure. This approach provides a reasonable RUL estimate without the requiring any a priori knowledge about the age of the equipment being replaced. RUL = EUL – replaced equipment age. Alternate equations involve the use of survival functions. However, these equations all require knowledge about the age of the equipment being replaced, which is not available for program planning, but could be available for program reporting. The primary drawback to the combined approach is that it can be gamed to get higher lifetime measure savings. If the equipment age is less than 2/3 of the EUL, then one might want to use the equation approach. If the equipment age is greater than 2/3 of the EUL, then one could claim not to know the equipment age and thus use 1/3 of the EUL for the RUL. Given our limited current understanding about appropriate RULs to use for energy savings calculations, we believe that simple use of 1/3 the EUL to be appropriate for the current DEER update. Kema recommended that RULs receive additional study as part of ongoing program evaluation studies. Free Rider - Those who consume a resource without paying for it, or pay less than the full cost of its production. Free riding is usually considered to be an economic "problem" only when it leads to the non-production or under-production of a public good The name "free rider" comes from a common textbook example: someone using public transportation without paying the fare. If too many people do this, the system will not have enough money to operate. Interactive Effects - Historically, the energy savings profile of a given efficiency measure has been considered in isolation. The impact of installing a single CFL, for instance, is estimated as the difference in its own energy consumption and that of the incandescent bulb it is assumed to replace. However, in some cases, measures have systems impacts, or “interactive effects,” which are not captured by baseline comparisons along a single parameter. Some energy efficiency measures, for example, produce less heat than the measure they replace. Depending on factors, including where they are installed, certain energy efficiency measures may increase the need for heating or decrease the need for air conditioning. IOU - Investor Owned Utility - The IOU's in California covered by RRIM are Pacific Gas & Electric (PG&E), Southern California Edison (SCE), Southern California Gas (SoCalGas) and San Diego Gas & Electric (SDGE&E). M & V – Measurement and Verification. Market Transformation - Any intervention in the market is transformative to some degree. Some interventions lead to greater levels of transformation than others. Some interventions have few transformative effects. It is also important to keep in mind that interventions can have negative outcomes, i.e., the early cool roof programs gave cool roofs a bad name as did the early heat pumps in the Tennessee Valley. Thus, we are working along a continuum from total and utter rejection to total and utter acceptance and acceptance aided by programs. Also, there is a tendency to treat interventions as having a singular effect when in fact the effects of interventions vary through time. RRIM – Risk Reward Incentive Mechanism - CPUC Proceeding R0901019 - An incentive mechanism adopted by the CPUC in 2007 to encourage the utilities to invest in energy efficiency. The mechanism enables the investor owned utilities to earn rewards on energy efficiency programs in amounts comparable to what the companies would otherwise earn through supply side investments. Decision 07-09-043 and 08-01-042, establish a performance standard for the utilities, under which the utilities earn incentives if their energy efficiency program portfolios achieve certain quantitative energy efficiency savings goals. Rewards are provided only after a minimum performance standard (MPS) is achieved. The reward rate increases from 9% to 12% if the utilities reach 100% of the energy savings goals. Penalties are included in the mechanism to discourage gross mismanagement, and the RRIM includes two penalties: per-unit (kilowatt, kilowatt-hour, therm) penalties are levied if performance falls below 65% of goals and a “performance guarantee” requires utilities to refund ratepayers if their energy efficiency programs produce negative net program benefits. 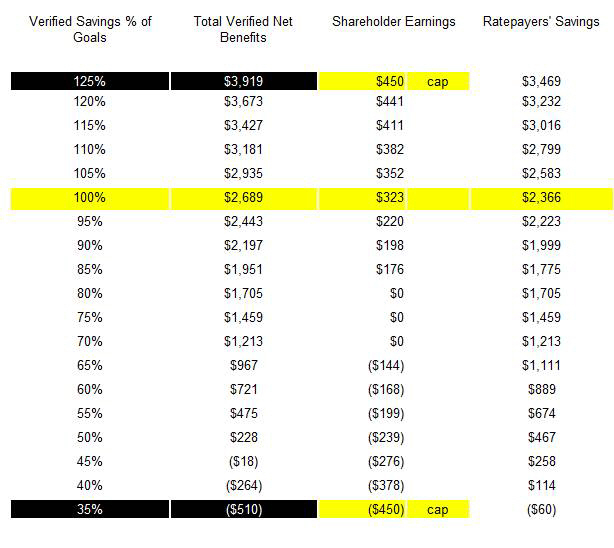 The costs of shareholder incentives are included both when evaluating the cost-effectiveness of program plans submitted during the program planning cycle, as well as when conducting a cost-effectiveness review of portfolio performance in hindsight. In addition participant costs and benefits are both adjusted to account for free riders, unless those costs represent program expenditures (utility revenue requirements). ERT - Evaluation Reporting Tools/Database - a combination of tools and processes that work in concert to calculate 2006-2008 energy efficiency portfolio performance results. The ERT core features were used to compile and evaluate alternative scenarios and resulting RRIM earnings based upon changes to key parameters. The ERT aggregates and reports efficiency savings performance at the level of measure group, program, and total portfolio. Based on specified parameter assumptions, the ERT generated scenario runs showing corresponding RRIM earnings. Ex Ante- Predictions in program planning documents - Assumed energy savings associated with a particular energy efficiency measure or equipment prior to installation. Thus, ex ante refers to using program metric assumptions based on past program performance. Ex ante measurement relies on engineering estimates or the results of ex post savings measurement (e.g., load impact studies) from previous program years or other programs. Ex Post True-up - An after-the-fact adjustment in the RRIM that was a key ratepayer protection. The original CPUC decision in 2007 provided that the utilities and the ratepayers would each be made whole in the event of overpayment or underpayment of interim incentives to the utilities. HIM - High Impact Measures - End-use measures or technologies that dominated portfolio savings. The IOUs claim that HIM methodology developed point estimates for certain measures and then applied them to similar measures across the portfolio. The Energy Division’s HIM focus allowed for a more efficient use of Energy Division resources, allowing for approximately 85% of the reported kWh, kW and therms to be included in the direct evaluation of gross savings. The error bound for the net savings estimates for GWh, MW, and MMTherms were added to Energy Division’s final evaluation report. Across the IOUs, the error bounds are +6% for electricity, +4% for peak, and +11% for natural gas at the 90% confidence interval. MPS – Minimum Performance Standard - The minimum level of savings that utilities must achieve relative to their savings goal before accruing any earnings, and is expressed as a percentage of that savings goal. PAC- Program Administrator Cost – Cost Benefit Analysis Methodology commonly used for evaluating utility sector Demand-Side Management. Contributes one-thirds of PEB. Under this test the program benefits are the same as the TRC test, but costs are defined differently to include all the costs incurred by the program administrator, including all incentives and all other program costs that become revenue requirements. The PAC test does not include the costs incurred by the participating customer. SSR - Shared Savings Rate - Varied depending upon the extent of success in meeting or exceeding adopted goal. TRC - Total Resource Cost - As discussed in D.06-06-063, the TRC test is the measurement of net resource benefits of a program from the perspective of all ratepayers, and is produced by combining the net benefits of the programs to participants and non-participants. The benefits are the costs of the supply-side resources avoided or deferred. The costs included in the TRC test are all costs paid by both the utility and the participant, which encompass the costs of the measures/equipment installed and the costs incurred to start and administer the program. The TRC and PAC benefits include estimates of supply-side costs avoided by the implementation of energy efficiency programs. 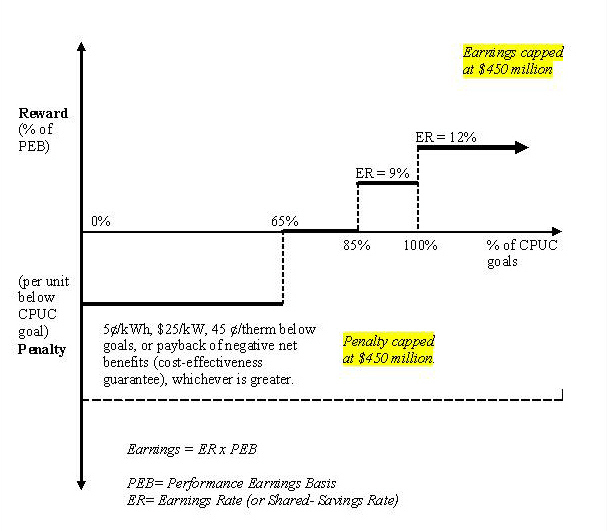 California Incentive Mechanism Earnings/Penalty Curve - There are no earnings or penalties within the "deadband" range of performance, i.e., greater than 65% and less than 85% of goal achievement. In order to provide reasonable limits to the risks and rewards under the incentive mechanism, penalties and earnings are capped at $450 million (all four utilities combined) for each three-year program cycle. 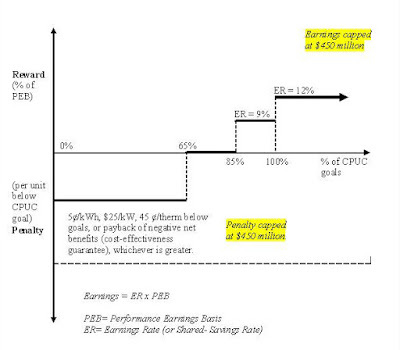 In December 2010, the CPUC ruled that performance would be based on ex-ante assumptions and the ER would be paid at 7%. SAVE - Solar Advantage Value Estimator - A online tool launched in August 2011 by the California Energy Commission which helps the housing market evaluate the value of solar on California homes. The Solar Advantage Value Estimator (SAVE) will give the industry a long term and cost-effective method for calculating the added value of solar photovoltaic (PV) systems on new and existing solar homes. SAVE calculates the value of a solar PV system on a new or existing solar home including the estimated value in annual energy savings. The tool uses the homeowner's unique address and zip code, the solar system size, specific climate zone data, and local electric utility rates. The solar PV system information is captured from existing solar rebate data including the Energy Commission's New Solar Homes Partnership (NSHP) and the Emerging Renewables Program. The information can also be entered by the user. Once the three-step calculation is complete, the user receives a present value amount for their solar PV system. Real estate professionals, appraisers, and builders can connect this information to potential homebuyers who may be deciding to 'Go Solar,' or to homeowners who are selling their solar homes. Cut power needs equivalant to three medium sized power plants. Avoid 3 million tons of greenhouse gas emissions. Create between 15,000 and 18,000 jobs. Cut Energy use by 20 percent for up to 130,000 homes in the state by 2012. Promote innovative programs to make zero net energy homes and commercial buildings ($175 million). Retrofit Public Sector Building ($260 million). Education and Training programs ($100 million). Promote Solid State lighting and other efficient light technologies. EA - Enhanced Automation Initiative - Pays large commercial and institutional customers to improve energy efficiency of existing building automation systems (BAS) or energy management systems (EMS). The program assists customers in the design and optimization of controls systems to help them manage their loads and participate in demand response programs in the state. The EAI is part of PG&E’s 2010-2012 energy efficiency program portfolio and is implemented by the EAI staff at KEMA Services, Inc.
Energy Saving Bid Program - SDG&E provides incentives for electric or gas efficiency projects that save at least 500,000 kWh or 25,000 therms annually. The incentives range from $0.07 to $0.20/kWh for electric measures and gas projects are paid at $0.80/therm saved"
Energy efficiency projects for large business in existing buildings. PG&E and SDG&E offer customized financial incentives. Equipment Rebates - SCE, PG&E, and SDG&E offer standard rebates for upgrading or replacing equipment such as lighting, HVAC, boilers, water-heaters, refrigerators, and others. LIEE - Low Income Energy Efficiency - Provides no-cost weatherization services to low-income households who meet the CARE (California Alternate Rates for Energy ) income guidelines. Services provided include attic insulation, energy efficient refrigerators, energy efficient furnaces, weather stripping, caulking, low-flow showerheads, waterheater blankets, and door and building envelope repairs which reduce air infiltration. The Commercial & Industrial Incentive Program provides incentives of up to $1,000,000 per customer for gas efficiency projects with an energy savings of at least 200,000 therms per year. The Express Efficiency Rebate program offers up to $200,000 in rebates per year and covers many energy-efficient gas appliances and improvements. The Gas Engine program pays 30% of the cost of replacing a natural gas engine, or $0.80/therm saved, whichever is lower. Incentives are capped at $25,000 per year. RNC - Residential New Construction sub-program. PG&E’s RNC encourages builders to construct homes that exceed Title 24 through a combination of technical education, design assistance and incentives. RNC also works closely with Zero Net Energy Homes Pilots Program. SMUD offers both customized and express incentives, generally for 30% of a project or up to about $50,000, depending on the measure. For the express program, incentives are provided for qualified efficient lighting, packaged air conditioners, process improvements, refrigeration, motors, and "cool" roofs. The Smart Grid with advanced metering infrastructure could provide interval metering used to approximate or simulate sub-metering, i.e., measurement of energy consumption at the end-use level. Consider the example of a utility program offering a rebate for an energy-efficient refrigerator. Today, the energy savings associated with that appliance would likely be deemed or calculated ex ante for evaluation purposes. Typically, such ex ante energy savings assumptions are discounted due to their inherent uncertainty, since they cannot be measured at the end use level. A Smart Grid infrastructure could allow the utility to sub-meter the energy consumption of refrigeration for households that participate in the refrigerator rebate program. By being able to measure and compare refrigeration consumption of program participants ex ante and ex post, the utility can reduce the uncertainty of, and more precisely gauge, the program’s energy savings impact. Assuming that the program proves cost-effective in yielding energy savings, the utility would be encouraged to expand the program and pursue it more aggressively, resulting in incremental energy savings attributable to a Smart Grid. Reduced Risk - More precise and reliable measurement and verification, as enabled by a Smart Grid, reduces the uncertainty of program impact and encourages greater program investment – as previously postulated – its impact can contribute towards bridging the gap between realistic achievable and maximum achievable potential. Automation – A Smart Grid infrastructure would automate aspects of M&V and thereby reduce M&V costs. Since M&V costs are typically included in a utility’s administrative costs to implement energy efficiency programs, this automation capability would render programs more cost-effective. 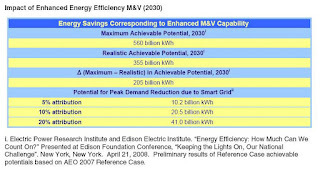 Enhanced Cost Recovery - The link between enhanced M&V and greater realization of energy efficiency is reinforced under the assumption that new ––business models may emerge that allow utilities to recover costs for energy efficiency in a manner competitive with cost recovery for generation resources, thereby providing greater incentives for verifiable energy efficiency. Saved Finance Costs - Steel-in-the-ground investments (generation, transmission, distribution) ratepayers have to pay not only the cost of the facilities, but also the financing costs (debt service, return-on-equity, and associated taxes) to compensate those that put up the initial capital. In contrast, since energy efficiency expenditures are expensed and reflected in rates immediately, energy efficiency saves ratepayers substantial financing costs. Potential earnings for the 2006-2008 program cycle start at $176 million if all four utilities achieve the minimum performance threshold of 85%, which in turn would deliver approximately $1.9 billion in net benefits. 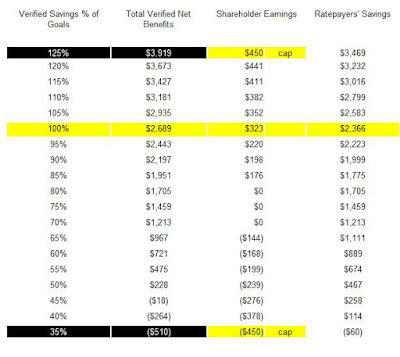 At the 85% level, the vast majority of the net benefits--$1.775 billion--goes to ratepayers. DRA opposes the CPUC Alternate Proposed Decision that would award the utilities $108 million based on outdated, inflated utility assumptions based on their self-reported goal achievements. It also seeks to change rules to the incentive mechanism going forward to favor expediency over actual energy savings, resulting in no accountability for the investment of ratepayer dollars. DRA has consistently argued that an incentive mechanism that motivates real, incremental, and persistent energy savings, is extremely difficult to craft. The mechanism adopted in D.07-09-044 may increase EE program costs by as much as $450 million, yet there is no evidence that this will increase energy savings, or the quality of savings. DRA’s fundamental position is that if there is going to be a shareholder incentive mechanism, it should hold the Utility administrators accountable for their EE program design and implementation, and that incentives must be based on actual verified energy savings. Ex Ante vs. Ex Post Measurement Issues - By way of example, for PG&E’s CFL programs, allocations of incentives to upstream lighting manufacturers/distributors must be made at least 120 days prior to the movement of the products into the marketplace. Therefore, the IOUs argue that the October 2007 draft EM&V Study (which indicated, among other things, that NTG values for lighting were declining) allowed little time for adjustments to program delivery and implementation to take hold during the 2006-2008. They argue therefore, it is inappropriate to apply these NTG values to the entire 2006-2008 program cycle for purposes of awarding incentives. Measurement Complexity – The implementation of IOU energy efficiency portfolios involves the installation of millions of individual measures across the state. Each of these installations can be any one of thousands of individual measures, each with an equipment cost, and installation cost, an estimated life, an energy impact estimate and an annual impact load provide that must all be know or estimates in order to convert the energy load impacts to both an avoided resource cost and GHG emissions reduction. Unlike expenditures for energy resources that are measured through arms-length transactions, energy savings cannot always be as easily quantified. To calculate cost savings associated with energy efficiency measures, it is necessary to develop assumptions as to relevant parameters based on surveys, sampling, and extrapolation of estimates over extremely large volumes of data points. Free Ridership – For each measure that is installed, it must be determined if the installation can be attributed to the IOU portfolio or if the installation would have happened without the IOU activity in order to determine the free-ridership level or the net-to-gross ratio. NTG Measurement Subjectivity- PG&E claims that in the final performance evaluation, many of the NTG ratios were estimated based upon inadequate sample size, insufficient survey response levels, and excessive delays in surveying customers regarding their motivation for participation in energy efficiency programs. Judgments may differ in estimating the effects of free ridership. Any measure of the NTG can at best only be an approximation. Measurement of NTG ratios has caused particular controversy both because evaluation methods depend on customer behavior survey results and because positive impacts in market transformation – for example, greater consumer awareness of the benefits of CFLs – will reduce the energy savings yielded by a given measure that will be attributed to the utilities. Studies that evaluate NTG ratios ask customers deploying energy efficiency measures to recall whether their decision to adopt such measures, sometimes more than a year before, was directly attributable to utility programs. However, if certain measures and their associated savings would be deployed regardless of the utility programs, it would be a waste of ratepayer REUmoney to continue to support those programs. Regulatory Framework – According to PG&E, The current regulatory framework is flawed due to the extremely high level of variability that exists between ex-ante planning assumptions and ex-post evaluation results that are retroactively applied to adjust achievements as if IOU administrators had the benefit of such information prior to portfolio design and implementation. This framework is unjustly punitive in nature because essentially IOUs are penalized based on ex post information that was not known at the time of portfolio design and was not considered when savings goals were adopted. POUs are very diverse in size, customer types, and program delivery approaches, making it difficult to issue “one size fits all” prescriptive guidelines for EM&V activities. Many POUs are very small and have limited access to EM&V resources or staff time to pursue evaluation activities. POUs have substantial faith in their internal verification procedures, which they believe ensure their programs are on track and delivering expected savings. As a consequence, few perceive a need for comprehensive third‐party EM&V, especially the extra expense of net savings analysis to determine free ridership and spillover savings impacts. POUs have no strong incentive to perform EM&V to prove that they did not inflate their savings claims. They do not have the shareholder reward mechanism that, at least partially, drives the EM&V process for the IOUs’ efficiency programs. In April 2010, The CPUC adopted a protocol to count energy savings from behavior-based energy efficiency programs in a decision on Evaluation, Measurement and Verification (EM&V) of energy efficiency programs for 2010 through 2012. This will afford programs that provide home energy reports, designed to engage customers to make better choices about their energy consumption using neighbor comparisons and personalized, targeted energy-saving recommendations, to be rolled out in California on a larger scale than in the past. Because these programs aim to motivate behavioral change, as opposed to hard-wired efficiency, they have thus far been treated as non-resource programs, ineligible for energy savings credit. However, the experience through a number of pilots in California and other region shows that these programs can produce a very real capacity for significant and measurable energy savings. CALMAC offers a downloadable list of firms that are interested in providing Evaluation, Measurement and Verification (EM&V) services for energy efficiency and demand response programs in California. You can download the file either in Microsoft Word or Excel format. DRA – Division of Rate Payer Advocates - San Francisco, CA - Public Advocate in California An independent consumer advocacy division of the California Public Utilities Commission (CPUC), Part of the California PUC Our statutory mission is to obtain the lowest possible rate for service consistent with reliable and safe service levels. In fulfilling this goal, DRA also advocates for customer and environmental protections. KEMA - HQ Arnhem, Netherlands, US: Burlington, MA - A global, leading authority in energy consulting and testing & certification Contracted with CEC to build DEER - Database for Energy Efficiency Resource - A CEC and CPUC sponsored database designed to provide well-documented estimates of energy and peak demand savings values, measure costs, and EUL all with one data source. LADWP - Los Angeles Department of Water and Power - the largest municipal utility in the United States, serving over four million residents. TURN - The Utility Reform Network - San Francisco, CA - A non-profit consumer advocacy group, on Wednesday submitted an application for rehearing on the CPUC’s recent decision to award shareholders of California’s investor-owned energy utilities $68 million in ratepayer-funded energy efficiency bonuses, because the decision was not based upon verified results as a previous CPUC decision had required. Flex Your Power Initiative - The California Energy Commission (CEC) maintains a database of California programs (searchable by zip code) that provide rebates and other forms of assistance for energy efficiency, load management, and distributed generation. DEER – CEC’s Commission’s December 2008 Database for Energy Efficiency Resource DEER is a database of Net-to-Gross (NTG), Effective Useful Life (EUL), and Unit Energy Savings (UES) values for standard or “deemed” energy efficiency measures. Energy Efficiency 2006-2008 Verification Reports - February 5, 2009. California Public Utilities Commission. California Energy Efficiency Groupware Application - This site allows public access to CPUC Energy Efficiency (EE) program reports for various program cycle.